I'm closing this by saying, "Chickens are delightful pets and teachers." What a sweet post, Manzanita. Thanks for putting it that way.. EVERYTHING around us really is a learning/teachine device. I miss having chickens. This is such a sweet way to bring the little one into the loop of life. A very lovely post. Life affirming, and filled with good. Just what I needed this very moment. Are you having doubts this very moment? We all do...... doubts about the uncertainty of the world and the future for these little innocent guys. I just read your amazing praise piece about me and I am blown away. I don;t know what to say except a huge :THANK YOU. I am not often left speechless but you have managed to leave me silent, blushing and blubbering. When I recover I will have something to say, but for now I can only tell you that I love you...not just for the praise, but for what and who you are. What a great idea! I wish I was there to see such a wonderful learning experience for the boy. He looks so cute with the little basket! What a marvelous wee post, Manzanita. And so true. Chickens are indeed delightful pets and teachers. As, of course are all creatures great and small. Shame so many of us don't open our eyes and hearts to the wonders of their world - as apposed to our own destructive one. Showing him where the food comes from and the food chain is sure a good way to learn indeed. Surprised he was so gentle with them and didn't, oopsy, break one haha bet puss has a ball watching them too. When the chicks were babies and in the house I was afraid Puss might think they were birds but she just watched them and now she walks through their yard and they all just sort of ignore each other. Well you'll have a friend for life in that 2 YO! Great idea and great post. First off, I just love that little fellow. Children usually have to be taught to be gentle. How neat he comes that way. Yes he deserved the first eggs and how sweet of you to make sure he got them. What a feel good post. Thanks....His parents say he loves to eat eggs for breakfast. No roosters in town? It's a natural alarm clock... Go green! You are the most wonderful neighbour that little boy could possibly have. I love how you are helping him learn about life this way. Had to giggle at grown people shying away from chickens! Hi Manzanita - what a quite delightful story and I'm sure the little lad will remember for many a long year ... great teaching tool for adults too! Egg soldiers? It must be a geographical difference, or perhaps I just missed out on it. Toast cut into small strips for dipping into the soft yolk of a boiled egg are called Toast Soldiers. Well I'll be darned. Learn something new every day. What a fun idea, esp. if the kiddies don't care for eggs. Aww, sounds like you (and he) are good neighbors. :) I love that you let him get the eggs! There are so many wonderful things that this story brings to mind. One is just the enthusiasm and "teachability" of young children. They really are supremely curious and want to know, learn, try everything. The next thing that come to mind was that MOST people don't know anything about chickens and eggs in this day and age. We are far and away mostly city dwellers and just expect the food to "show up" in the grocery store. So that makes this experience at least twice as nice for this little one. Lastly, it is wonderful that you are about to be in supply of a constant source of organic eggs. I really love eggs. I think is one of nature's most perfect foods. You are such a thinker. I love the way you can get so much out of writting. I agree on all counts and I do think that kids should learn where all that fresh produce in super market comes from. I notice that the eggs that are labeled organic in the stores, can't compare to the ones right out of the nest and eating organic feed and ranging freely. My chickens have 1/4 of the yard to roam around and hunt and scratch. This is a very large yard. It used to be the dog run but I fenced in the rest of the yard so the chickens had their own place and Cody can run 3/4 of the yard. My health provider says I need 3 egg yolks every morning. She (health P.) is older too and she eats 6 to 9 yolks a day, depending . with chickens. No roosters allowed in town? How rude! It's just a sexist town and that IS rude. Playmates... That can't be good. I hate sexists and sexist towns alike. I grew up among women, and I'm still waiting for women to send all those male politicians to do some ironing. This is one of the sweetest posts I've read today, Manzi. I can imagine him little hand carefully picking up the egg. His whole body in awe. Sigh. Sweet! 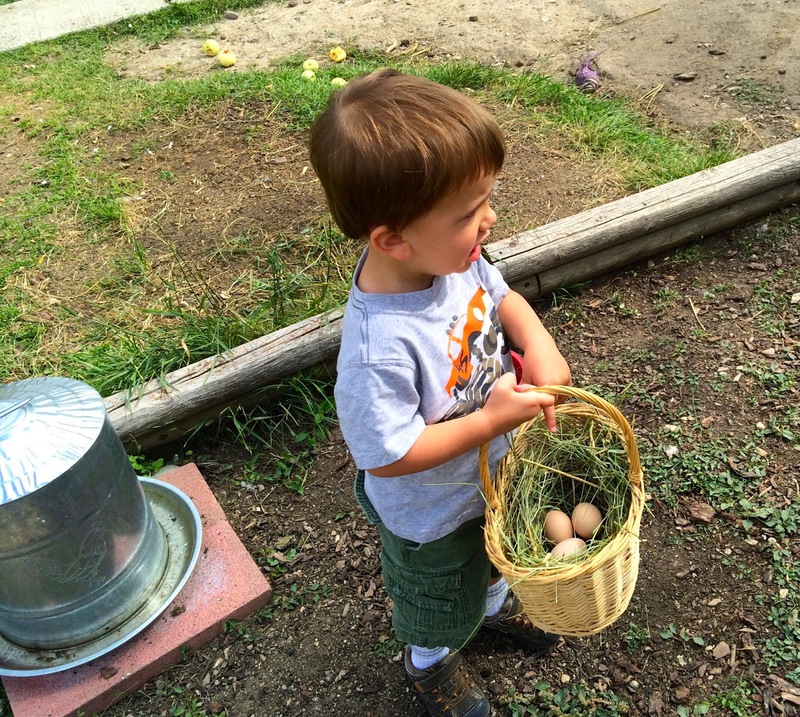 I kinda doubt that he's handled eggs before, but he was very gentle with them. It's strange but when my own kids were small, I was so busy, I never had time to notice the simple beautiful childhood growth. Today, I can take the time to appreciate the wonderment of learning. He will probably always appreciate chickens but unfortunately he will forget who taught him. Two is so young and people never recall memories of that age. I hear people say they have a few sketchy memories of around 4..... prob the earliest. How adorable. I loved the post and what a great lesson for the little fella. Thank you for stopping. I also paid a visit to your blog. Good to see you came out of the sun. Haha Thanks for for the tender comment. I had someone on a blog yesterday ask about raising chickens. I'll have to remember who that was --and refer her to YOU. Well at least he'll grow up not being afraid of chickens. I keep a small jar full of chicken feed on a bench in the chicken yard. First on the little boy's agendy is screwing off the cover (which I think is good for those little hands) and dipping into the feed so he can feed them by hand. Dear Manzanita, this posting is wholly satisfying. Like you I"ve always liked chickens. Mom raised them on our farm and like that two-year-old I slipped my hand under their brooding bodies many many times and brought the eggs into the house for breakfast. What a gift you gave your neighbor child. He must have been so awed and I bet he beamed as he took away the eggs to his mom for frying. Peace. Oh, I bet you did raise chickens during your life on the farm. Chicken manure is so great for garden fertilizer and eggs are the most perfect food of foods. It's funny the way broody hens don't want to be moved. Haha Think of how lucky we were to be raised on that powerful organic food. You mean you DON'T get eggs at Shop-Rite? I'm not familiar with Shop-Rite but it sounds like a place that puts emphasis on dollar value. Pre-chickens, I bought organic eggs at Costco but my belief system turns off when I see the name organic. Who knows what the chickens eat????? I see no point in having chickens unless they are truly organic and eating all organic feed. And organic feed is expensive so I always have my doubts, too, when I buy eggs from a health food store and the label on the box is from a small chicken farm. I don't see how they can make any money because the feed is so high and then I even have doubts about the organic feed. I just don't trust anything anymore, do I? I guess not.... it's the age and unfortunately I've heard too many lies. So all your chickens turned out to be shes and not hes. I knew you thought one might be a rooster at one point. How sweet you let your neighbor boy have the first eggs. Nope, all hens..... thankfully. They are all so tame I would have felt like a murderer if I had to get rid of a rooster for the chopping block. They are so tame, it would have just laid it's little head on the block. What a horrible thought. "Chickens are delightful pets and teachers." That they are. I used to tend them on my uncle's farm way back when and started raising my own about 5 years back. We're now awaiting the first eggs of a new batch of hens. How exciting. Chickens are so much fun, aren't they? I look forward to the poop, too, for the compost pile. All of mine are laying now but they are still the little pullet eggs. I tore apart my veg. garden and let them in the fence. They were excited about that. Yes they are, every day is entertaining with those little feather balls. I'll be letting mine loose on the garden remains this weekend, weather permitting. The art of adore... is largely typically the art of persistence. There really is someone older than I am.